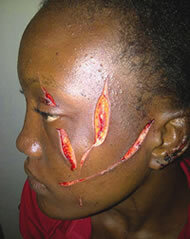 The two ladies were said to have assault another member of the church named Hannah Okurabe with razor blade cut on her chick, eyelids and back. This was as a result of an earlier fight over the choirmaster of the church and it happened few meters away from the church on the 17th of March 2013. Funny enough, the Choir Master is married and also a father of two. The ladies are were charged at the Chief Magistrate’s Court in Ebute Metta, but they pleaded not guilty. Moreover they were granted bail of N200,000 each stating that it is a bailable offence !!! They are presently remanded at the Kirikiri Minimum Prison. Are this ladies meant to be granted bail or have a feel of what it is to stay in prison for 1year or more?